When you think of ancient Roman sites, the iconic Colosseum in Rome and the ruins of Pompeii outside Naples are the two that first come to mind, but Italy has beautiful archaeological treasures from the Alps to Sicily. Many don't know, for example, that the elegant provincial city of Verona is home to one of the most spectacular and best-preserved Roman amphitheaters in Italy - the Arena - built in the first century AD to seat more than 30,000 spectators. Though most of the original pink and white limestone outer facade was destroyed in a catastrophic earthquake in 1117, the Arena's interior is still intact and it remains one of the Italy's most famous venues for summer concerts, opera, and other al fresco musical performances a full millenium after it was built. Audiences love its outstanding acoustics and stunning architecture, and events here are often sold out months in advance. The main annual event at the Arena, and one of the most prestigious music festivals in Italy, is the Opera Festival held each summer. Now in its 95th year, the festival is known for its eye-popping productions, complete with extravagant set designs and special effects, hundreds of cast members, and - in the case of Aida - live animals. This year, five different operas will be performed: Nabucco, with a completely new stage design created for the 2017 Festival; Tosca, reviving its magnificent 2006 staging by Hugo de Ana; Rigoletto, directed by directed by Ivo Guerra; Madama Butterfly, featuring the iconic stage design by director and producer Franco Zeffirelli; and Aida. 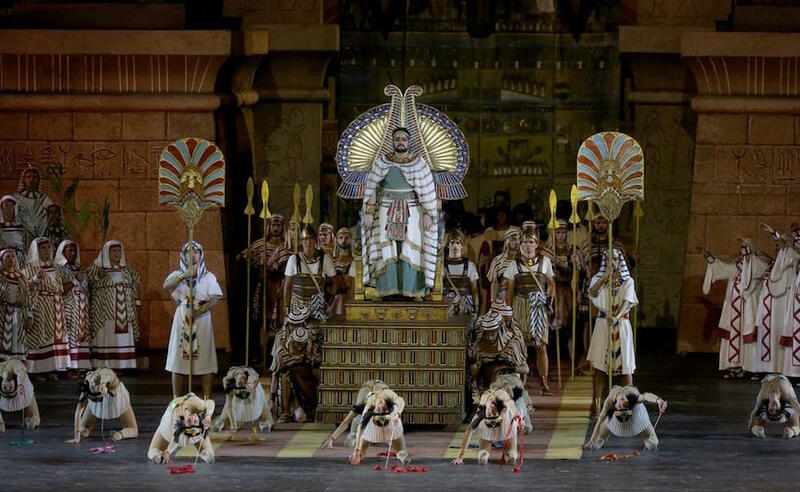 Aida is the Opera Festival's most famous production, and will be performed both with the historical stage design dating from the 1913 production which celebrated the centenary of the birth of Giuseppe Verdi and the futuristic stage design and production under the direction of the Catalan La Fura dels Baus theatrical group. Any of these performances are sure to be a once-in-a-lifetime evening of stunning staging, impeccable music, and an unforgettable venue. If you would like to see one of opera's most famous tenors, Placido Domingo will be performing some of the most beloved Spanish arias during his Antología de la Zarzuela gala evening on July 21st. This is sure to be among the most anticipated evenings during the festival, and an opportunity to hear one of the greatest voices of the century live. Beethoven's Symphony No. 9 in D minor, Op. 125 was the composer's final symphony and is one of classical music's most famous works. Completed in 1824, this symphony was groundbreaking in its use of voices - both soloists and a chorus -in the final movement. It is one of the most performed symphonies in the world, and sure to be a crowd-pleaser on the evening of August 15th, Italy's summer Ferragosto holiday. Dancer Roberto Bolle is to Italy what Mikhail Baryshnikov was to the US in the 1980's: a classically trained dancer whose fame spills over into popular culture, due to both talent and physical beauty. Originally from Piedmont, Bolle has been dancing since he was seven years old and is currently the first male Italian principal dancer with the American Ballet Theatre and principal dancer étoile La Scala Theatre Ballet, in addition to performances he has given with the world's most prestigious companies from The Royal Ballet to the Bolshoi. Bolle is beloved celebrity in Italy, often appearing on talk shows in addition to being photographed as a model for fashion magazines, working as a spokesperson for designers including Ferragamo and Armani, and being featured in ads for the Italian electric and gas company and Fiuggi mineral water. But his heartthrob status doesn't detract from his well-earned reputation as one of the world's most talented dancers, and any fan of classical or contemporary dance shouldn't miss this opportunity to see him perform an exclusive program designed for the Arena on July 17th. 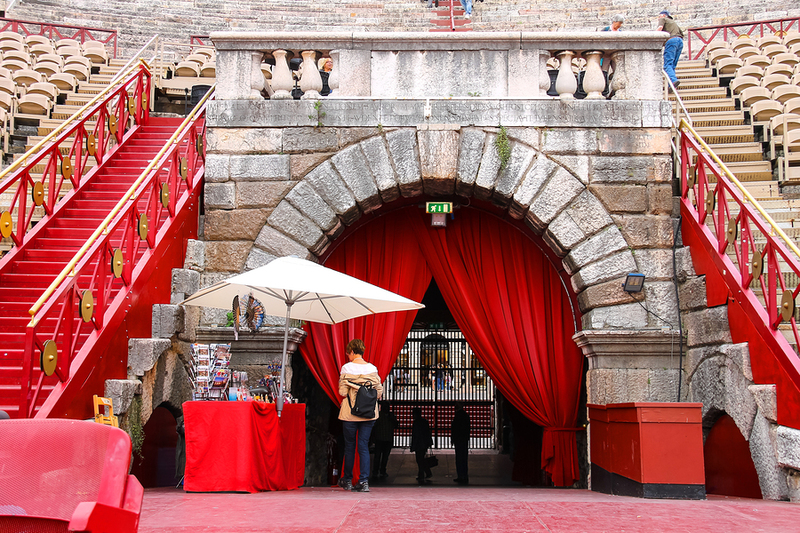 The Arena di Verona has an excellent website with details of each performance and an interactive calendar, and an online purchasing option for tickets. Before selecting your seat, you can take a look at their detailed seating plan with seat descriptions and prices to decide the best option for your budget and stamina (see below). There are also discounted seats for those under 30 and over 65, and open tickets giving you the option to choose the specific performance and date at a later time. You can also go directly to the ticket office outside the Arena to see what tickets are available at the last minute, even for shows that same evening. Location and hours are listed on their website tickets page. Though the Arena opens its doors at 7 p.m., performances begin in the late evening when darkness falls over the open-air amphitheater and often end past midnight. It's a good idea to bring a light jacket or sweater, as the air cools off significantly after sunset, but otherwise there is no dress code for performances. The most inexpensive spots are the stone stadium steps, where audience members are provided with small “mocoleti”candles, harking back to a time when there was no electric lighting in the Arena, and can rent cushions rather than sit directly on the stone. Though these seats provide an good view of the stage and the sight of hundreds of flickering candles ringing the ancient stadium is breathtaking, the backless stone steps can be uncomfortable for the three to four hour opera performances and the unnumbered seats means that you have to line up as early as 5 p.m. to get the best seats. If you would rather have a more comfortable chair with a place to rest your back and not have to scramble for a spot, consider splurging for a numbered seat with a backrest. As with all opera performances, you will enjoy the experience much more fully if you familiarize yourself with the work in advance. The Arena offers synopsis of each opera on their website and you can purchase a libretto at the amphitheater before the performance, or simply download a summary or libretto from the many available online for free. Remember that it may be hard to read printed material in the low light during the show, so keeping it on your (dimmed) device to consult is a good option that won't disturb other audience members. Refreshments are sold from the concession stand and vendors before the performance and during the intermission, and there are public restrooms inside and outside the Arena. For more practical information, you can take a look here.